Pizza Pasta Salad...say what? Yep, you read that right!! 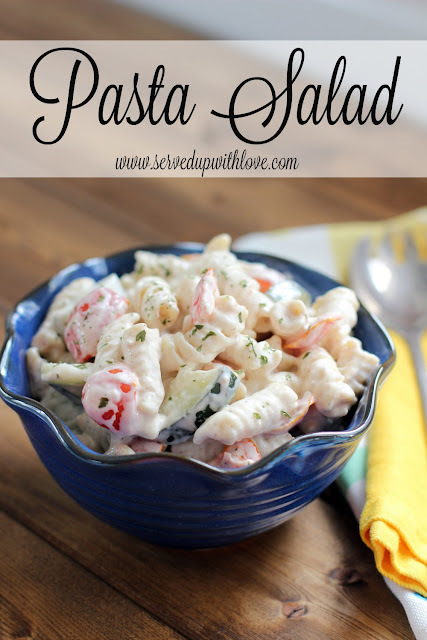 This Pizza Pasta Salad is to die for good. The best part of this is the homemade dressing. Of course, pasta salads are a must during the summer when grilling out happens a few times a week. Not only is this pizza pasta salad good as a side dish, I enjoyed it for lunch a couple of days last week. The dressing just gives this pizza pasta salad a boost in flavor that will just keep calling out to you. Just begging you to come and grab a bite or two. It is just that good. I have to admit, most pasta salads that I make are made with a store bought dressing. While they taste good, I know they are not always the healthiest option. But lets face it, I just love the ease of being able to just dump, stir, and head on my way. 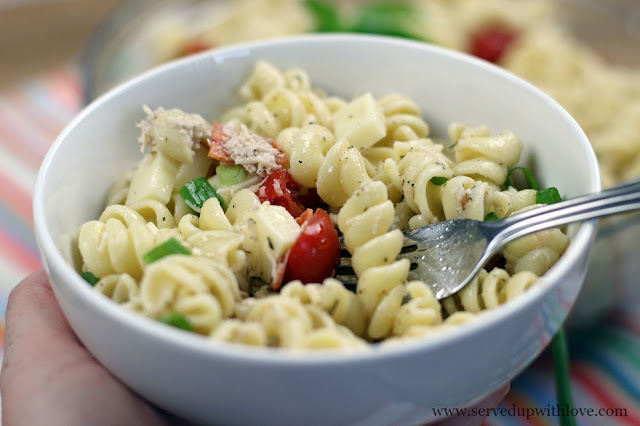 I wanted to try my hand at making a pasta salad that you could make without that dressing bottle. Boy, did I have a winner with this Pizza Pasta Salad. The seasonings, red wine vinegar, cheeses, and pepperoni taste just like a slice of pizza. Well, maybe not exactly, but pretty darn close. 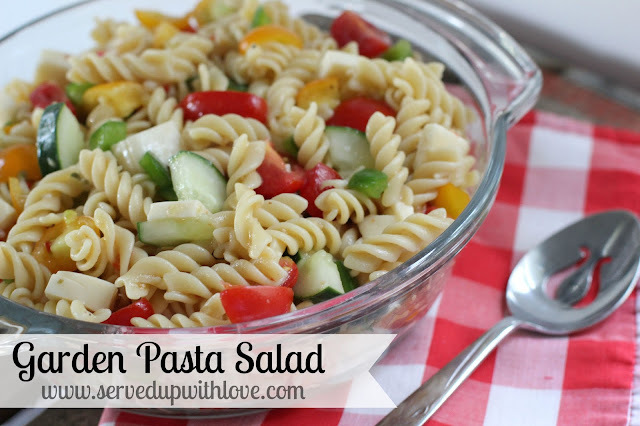 This will be my go-to pasta salad for any get-togethers or BBQ's we have planned for this summer. 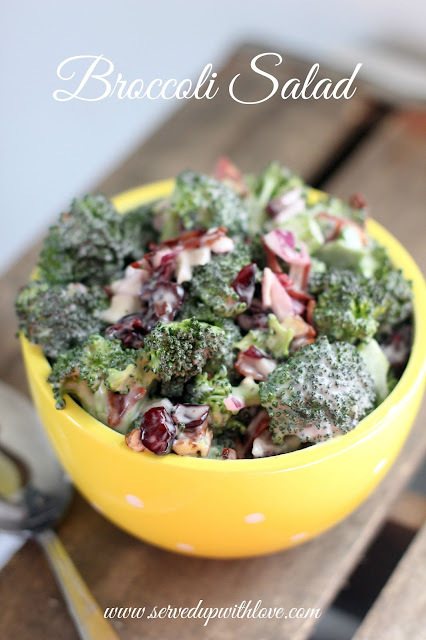 Don't let the thought of making that dressing yourself steer you away from trying this. You really can't get much easier than this unless you open a bottle of dressing. I have yet to run across a store bought brand that tasted anywhere close to this. 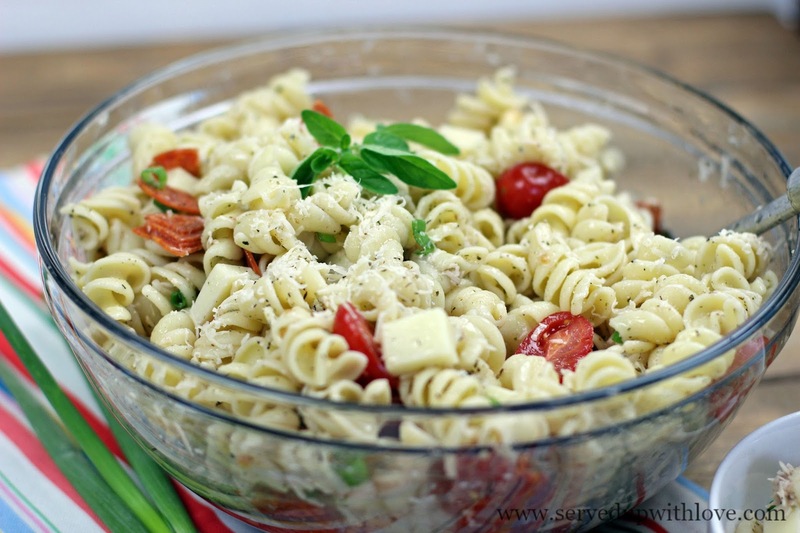 So trust me on this, make this pasta salad!! 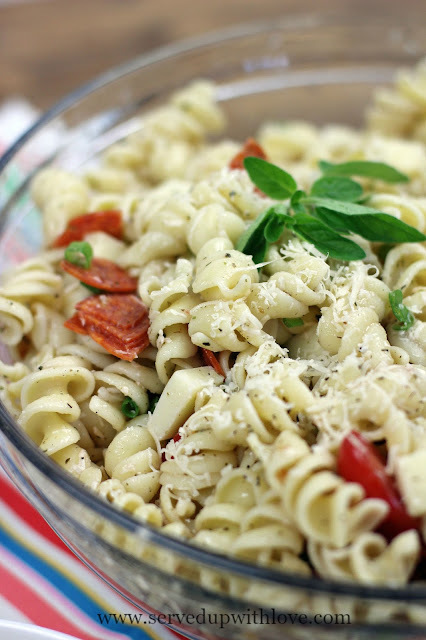 In a large bowl, combine cooked pasta, tomatoes, mozzarella cheese, green onions, and pepperoni. In small a small bowl combine oil, Parmesan cheese, vinegar, and seasonings. Pour mixture over pasta mixture and stir until combined.